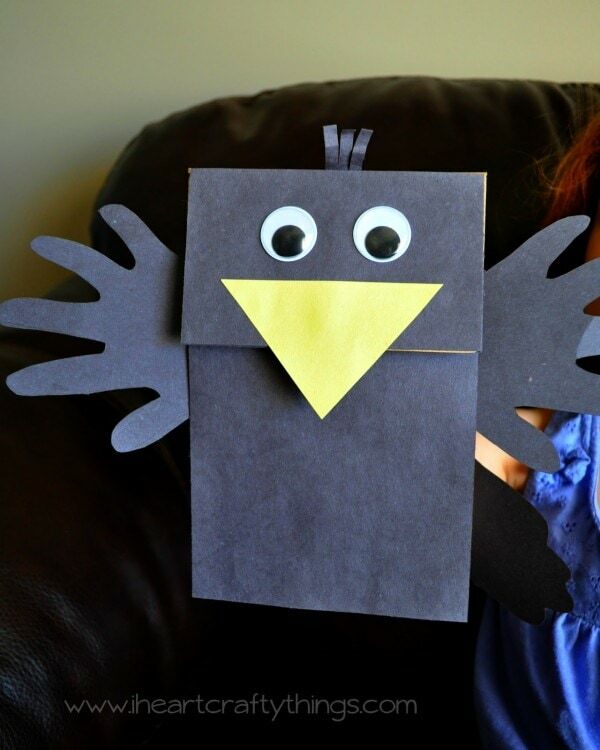 I have a huge love for birds and bird crafts! My Daughter recently had so much fun playing with our Peacock Puppet Craft so I’ve had an itch for us to create another bird puppet for her to play with. 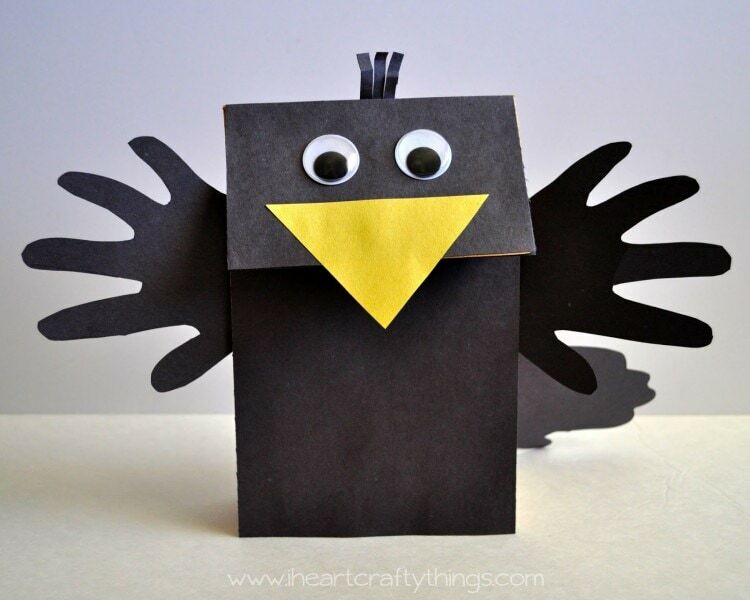 Since Fall time is upon us, I thought it was a perfect time to create a Crow Puppet! 1. 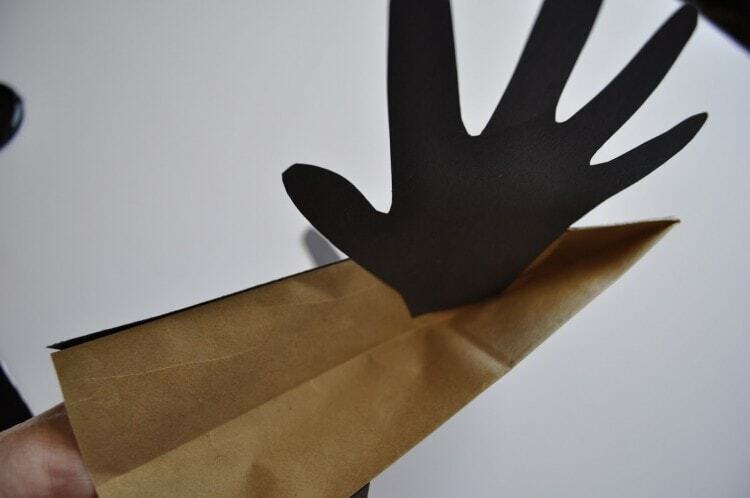 Start by tracing your child’s open hand prints on one your black construction papers. Also, trace one of their hands in a closed position on your paper. Cut them out. 3. 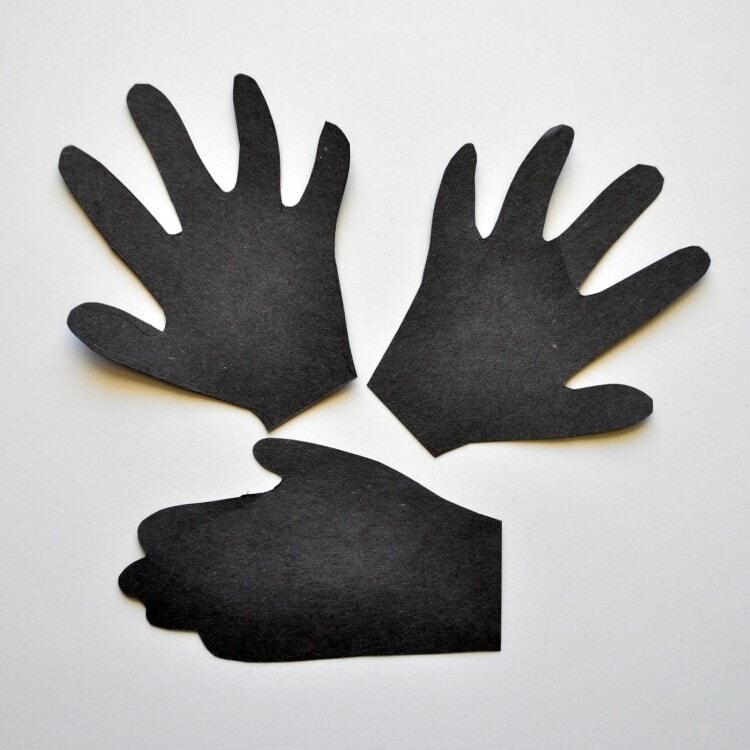 Now you need to measure and cut out the remaining pieces you will need for your puppet out of your black and yellow construction paper. See the picture below to see all the different pieces. 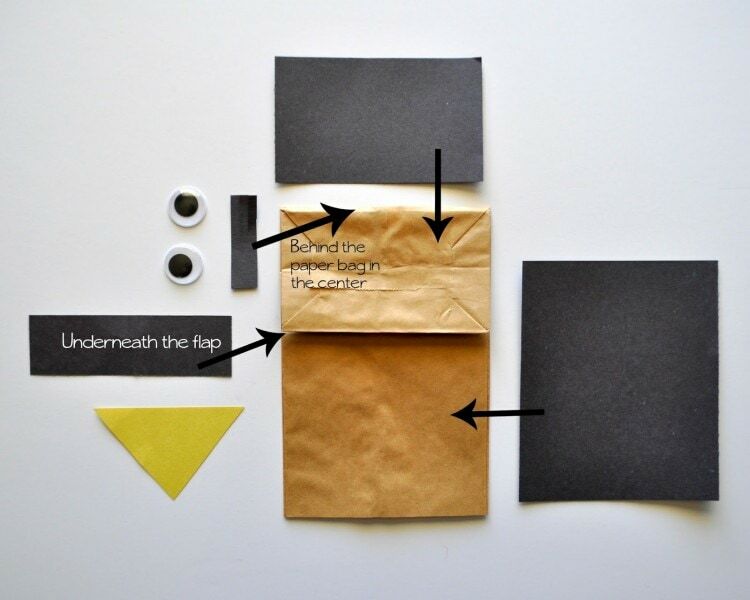 I found it easiest to measure with a ruler the width of the paper bag, and then cut the entire length of my black construction paper to that width. Then I measured the length of each individual section of the paper bag and cut that off of my black construction paper strip. 4. 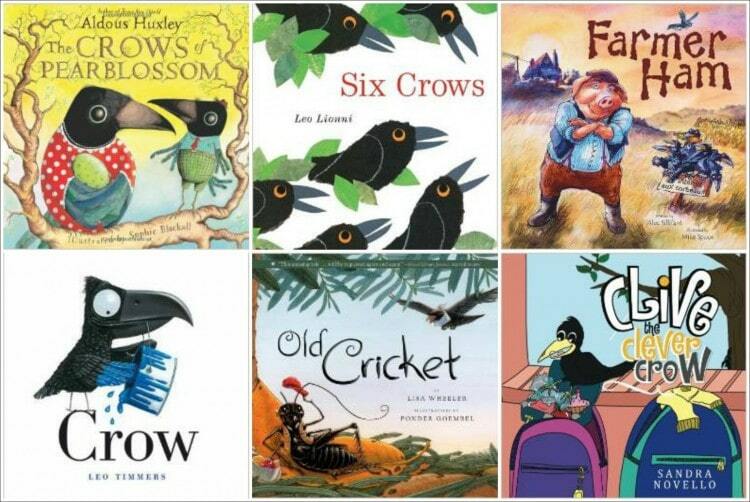 Have your child use their glue stick to glue all the pieces on to their crow puppet. You can see in the picture above where all the pieces go. 5. 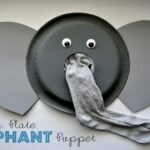 Lastly, glue your handprint wings onto your puppet. 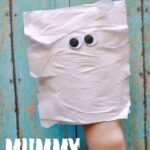 Glue the closed handprint onto the back of the puppet, and the open handprints on the side of your bag, on the front half of the folding flap. The prep work of cutting out the pieces takes a bit minutes, but the end result is seriously darling! And so much fun to play with too! 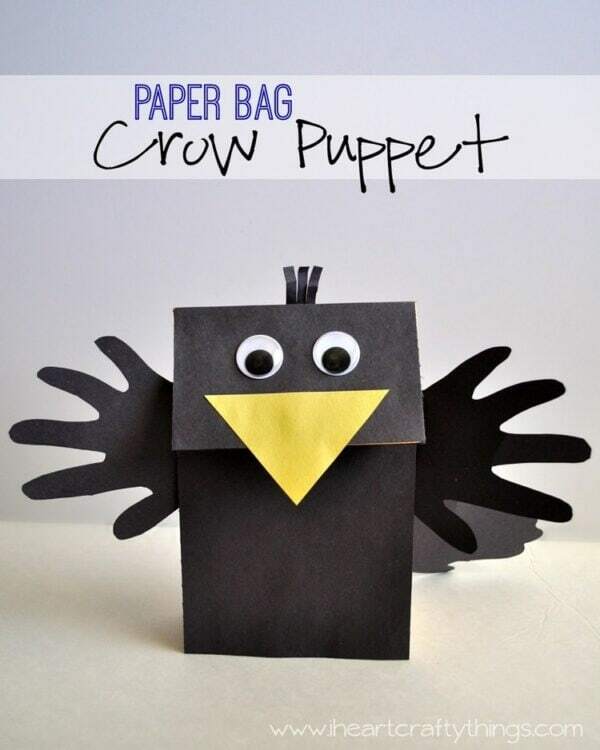 If you are doing this craft with several children, you could easily create a pattern of the paper bag pieces and have the children cut out their own pieces to save time, and to help them strengthen their cutting skills. 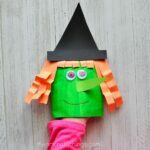 Looking for some books to go along with this craft? Hi, Your tutorial is very helpful to me.I am going to try it for my kids school project.Even I am crazy about doing craft work!